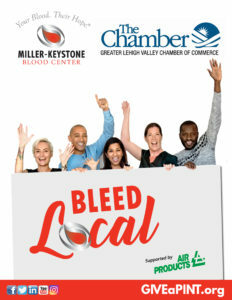 Greater Lehigh Valley Chamber of Commerce businesses and Greater Reading Chamber Alliance members have supported Miller-Keystone Blood Center’s life-saving mission since its inception. In partnership with the GLVCC and GRCA, Miller-Keystone offers a unique way for Chamber members to get more involved and help save more lives in the community. 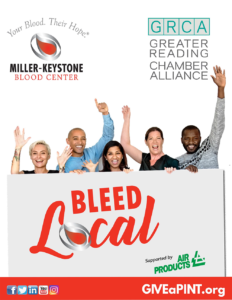 Through our Bleed Local program, Chamber members can enjoy special perks by customizing their level of support through hosting Blood Drives, contributing financially or simply branding your business Bleed Local!